Pound for pound, it’s hard to fault Logic’s feature set. The 10.4 update adds great new features at no extra cost to existing users. Smart Tempo has a versatile approach to audio and matches the ‘elasticness’ of rival DAWs. The new plugins will interest EDM-ers, with the Multi-FX options’ compelling additions to Logic’s effects suite. The minimum system requirement operating system is either Sierra or High Sierra, so you may need to upgrade in order to install. ChromaVerb sounds great but its GUI might be a little ‘consumer’ for some pro users. Perhaps the most significant addition within Apple’s free Logic Pro X 10.4 update is Smart Tempo, which builds on the ‘elastic audio’ qualities provided by Flex Time. Now, a number of Tempo Modes are offered which let you work with audio in new ways. For starters, you can make audio recordings freely, with no click, and Logic will detect the tempo and build a map from it. Suppose you then want to build your track around this ‘free time’ section but want to import an audio file with a different tempo. A quick switch of mode will allow this to be integrated ‘in time’, without the need to enter Flex Mode or to reach for a pair of scissors for manual chopping. Smart Tempo is definitely helping Logic approach parity with Ableton Live’s audio processing in this regard. There are additions in terms of the range and quality of Logic’s native effects too. The Vintage EQ Collection models classic hardware by providing three tone processors which match the sound and design of classic Neve, API and Pultec EQs. Two multi- effects processors are added too. The first, Phat FX, provides twin Filters, Distortion, Modulation FX, Bass Enhancement, easy compression and more as ‘targets’, while Envelope Following and twin LFOs are provided as sources for modulation. Meanwhile, Step FX organises its activities around a step-sequencer of up to 128 steps in length. Once you’ve configured a pattern you like, you can use its steps as modulators for Mod FX, Delay, Filter, Distortion, Reverb and Master modules, with a vast array of potential parameter targets available. Both Multi-FX processors also offer X-Y controllers with assignable parameters too. Any assignments are neatly shown around target parameters in blue, to help you keep track. Also new is an algorithmic reverb named ChromaVerb. This offers a choice of algorithms and an extended parameter set to let you tweak these. It’s a good partner for Space Designer’s convolution approach. 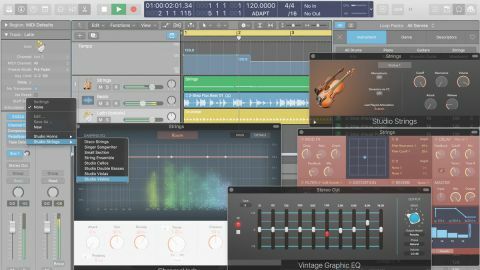 For those seeking resources to aid media composition, the best additions are two new plugin instruments, Studio Strings and Studio Horns. Emulating the third-party sample libraries they compete with, these offer multi- sampled instruments in solo player, small and large ensemble groups while the articulation lists for each instrument are wide-ranging. Better still, this update introduces Articulation sets, which allow you to more readily work with different performance techniques for any sample library (both from Logic and third-party content). Upgrading is a no-brainer for existing users and there’s even more to tempt the unconverted.